Have you noticed that your company’s shipping expenses are spiraling out of control? It’s a very common problem, especially as a small business starts to grow into a larger one. The problem is, mistakes become more costly as your business gets bigger. Especially here in the New York City area, no business can afford to waste money and stay competitive. So, read on to find out how you can reduce shipping costs by changing 7 common bad habits when it comes to shipping. Most of these bad habits are a result of not really giving much thought to your company’s shipping policies and practices. The fact that you’re reading this means you’re already on the right track to reduce your shipping costs! Here’s how. Office workers can easily get into the habit of doing the same thing the same way every time, even if it doesn’t make sense to do so in every case. When it comes to shipping, that tendency can cost you a lot of money. This is absolutely true: a large city municipality (name withheld so nobody gets in trouble!) found that they were spending over $800,000 per year shipping packages to other government offices within the same city. Looking further into their records, they realized that $500,000 of that expense was for shipping packages overnight to other floors within the same building! All they had to do was take a walk downstairs to get the package there faster and save half a million dollars a year. This example that may sound extreme, but this type of scenario is a lot more common than you may think. That’s why, to reduce shipping costs, you need to be regularly reviewing your company’s shipping records to catch easy ways to save money. It used to be that companies could negotiate a rate with one carrier, and know they were getting the best deal for shipping all their packages. Those days have come and gone, so if you are still using the same carrier to ship everything, you’re leaving money on the table. Today’s shipping rates are extremely complex, and rate structures vary so much from one carrier to the next that it’s very difficult to compare them. Depending on the size, destination and delivery timeframe, USPS might be the best way to ship some packages, while UPS is cheaper for others. And FedEx might come out on top for still others. To reduce shipping costs, you need to compare rates for each package. But nobody has time to spend an hour going to each carrier’s website every time you have to ship. Pitney Bowes’ SendPro solution lets you see all rates for all 3 carriers in the same place, so it only takes seconds to choose the cheapest way to get your package to its destination on time. That means your company can significantly reduce shipping costs with no added effort. Want to find out more about how to make shipping less time-consuming and save money at the same time? 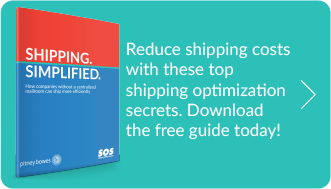 Get this helpful ebook: Shipping Simplified. You know this is true: your office manager likes talking to the guy in the brown uniform every day, so you always use that carrier for shipping. Needless to say, this habit causes you to spend more than you need to on shipping. When you start to compare rates, you’ll see that there are many instances where you can reduce shipping costs by using the most economical carrier for each package. You may remember the old FedEx ad campaign: “when it absolutely, positively has to be there overnight.” Lots of people still believe that they need to use FedEx next-day air to make sure a package arrives the next day. In many cases, USPS Priority Mail will get the same package there overnight for a third of the price. Another way to reduce shipping costs is to cut the cost of mailing by using a postage meter. Doing so automatically gets you reduced commercial rates. Check out this savings calculator to see how much you can save. This is another mistake that can cost you a bundle. It’s not just always going with FedEx that’s a mistake, it’s always choosing next-day air. Many times ground shipping can get your package there the next day for a lot less. It’s not entirely your fault: the carriers encourage this mistake by making you choose the shipping method first and then giving you the price. Instead, use a multi-carrier solution like SendPro that lets you see ALL the options that get your package to the destination on time. Then you won’t overlook the times when ground shipping makes more sense and will reduce your shipping costs by quite a bit. When shipping addresses are not in a central database, it’s easy for mistakes to happen. For example, an address is updated in the UPS website address book, but the next package gets shipped by FedEx, with the wrong address. These mistakes mean delays, increased cost to ship the package again or re-route it, and worst of all, unhappy customers. That’s not even counting how much carriers charge you to make address changes (look at your bills and you’ll see what we mean). Instead, reduce shipping costs by keeping all your addresses in one central location using SendPro. The system checks for corrections before printing a label (is it Street or Avenue?) to avoid change charges. And any address corrections make by your staff will be updated for all carriers. As we mentioned, shipping mistakes get expensive when you’re not monitoring what’s going on. Pitney Bowes’ SendPro solution makes it easy to see all your shipping expenses across all the carriers you use, as well as track shipping by sender. As your organization grows, this data becomes a valuable resource for identifying practices that need improvement and to reduce shipping costs. We understand that choosing the right business solutions can seem complicated. Let the experts at SOS make it easy: give us a call anytime and we can answer your questions.